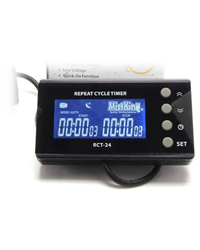 Repeat Cycle Timer is the ideal choice for aeroponic and other growers. You can now control misting with separate repeating ON and OFF intervals for day and night. This repeat cycle timer goes beyone flexible. While many other RCT rely on a photo cell to switch from day to night mode, we use the timers internal clock to accurately specify when the switch should occur. This is much more precise. In addition you can configure exact day and night mode starts.